When it comes to dogs, you will generally come across 2 basic types. One which runs away at the mere mention of the word “water” and the other which considers every puddle and muddy pool as something to savor and enjoy. It is true that dogs love to get messy. Although your beloved dog will love to roam around dirty and smelly, it is always better to give the animal a much needed bath. This will help the pet smell and feel fresh for a long time. Using harsh shampoos for your pet and giving them a bath too often can easily strip out the oil that makes the coat of your pet smooth and silky. This is especially true for Labradors. Thus, it is very important that you choose the Best Dog Shampoo for your pet with utmost care and caution. Why Use A Specialized Dog Shampoo And Not One Meant For Humans? Sometimes you may be tempted to use a shampoo and conditioner on your pet which is actually meant for humans. This may prove to be harmful for your dog. Using such products on your pet once or twice can still be acceptable. However, frequent use of human shampoos on your pet is a strict no-no. It will prove to be rather harmful for their skin and coat. 2 reasons support this fact. When it comes to shampoos meant for humans, these products tend to be slightly acidic in nature in order to clean human skin properly. Human skin has a pH level of around 5.2 to 6.2. On the other hand, dog skin is slightly alkaline in nature and has a pH of up to a maximum of 7.5. Using acidic shampoos can easily damage their skin and make them vulnerable to various types of bacteria attacks. When compared to human skin, dog skin is very sensitive. Their skin has only 3 to 5 layers, whereas, humans have 10 to 15 layers of skin. This makes human skin strong enough to accept the battering of various types of harsh chemicals and products. On the other hand, dog skin will easily feel an irritation upon use of such harsh chemicals. This may lead to scratching, dryness, and even abrasions. 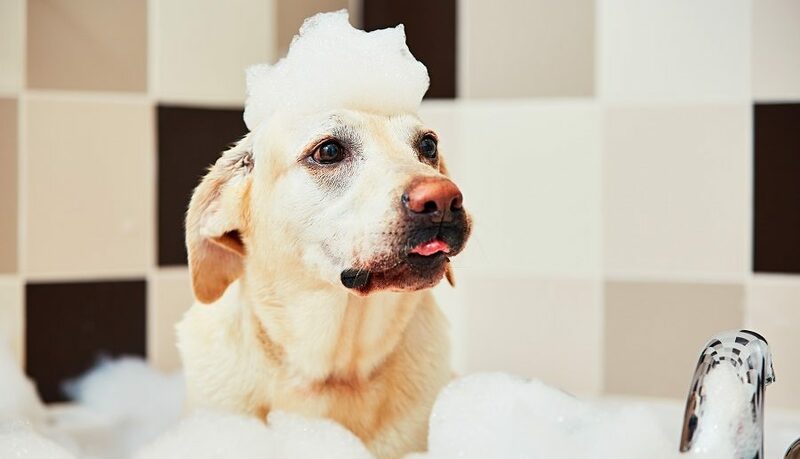 However, if you do not have any dog shampoos at home and you still need to bathe your pet to get rid of a smelly situation, then you may go ahead and use a mild shampoo, which is particularly used on newborn babies and little children. How Often Do You Need To Bathe Your Pet with Dog Shampoo? This is one of the most commonly asked questions, especially by people who have allowed a dog in their family for the first time in their lives. Well, the simple answer to this question will vary from one to breed to another. The individual habits and lifestyles will also play a major role in answering this question. Does your pet love to play outside in the dirt? For such dogs you may opt for a dog bath every 4 to 6 weeks. However, in between if your dog gets smelly you may give it a bath with plain water and properly rinse the animal. On the other hand, if your dog usually spends its time at home and seldom gets dirty, then you may give it a proper bath once every 2 to 3 months. However, if you have a Labrador, then bathing the animal once every 3 weeks should be a good idea. Even if you bathe the animal less often that would not be a major problem. If you bathe your Lab too often it will dry out the oily double coat which will reduce the capability of the animal to insulate itself. What to Expect If You Bathe Your Dog Too Often? When humans use a lot of shampoo on themselves, it tends to make their skin go dry. Similarly, dogs also experience the same thing. This may lead to scratching and irritations which in extreme cases can also lead to lesions. If you shampoo your dog too often, it may reduce the natural shine of the dog’s hair and may also make it go brittle and damaged. Do you feel that the hair on your dog is rough? Frequent shampooing may be the sole reason. Opt for a daily brushing schedule. This will help your dog look healthy and clean at the same time. What to Expect If You Do Not Bathe Your Dog Often? It is true that bathing your dog too often can lead to various complications. However, it is also true that if you do not bathe your dog it will put the dog’s skin and health at risk. Humans breathe in allergens. However, when it comes to dogs they use their skin to absorb them. If you do not give your dog a bath on a regular basis, it may lead to skin irritations and scratching. It is very simple to simply throw your pooch into the bath tub, lather and then rinse it repeatedly. However, if you wish to get proper results, then a little planning will be a good thing to start. Before you decide to give your dog it’s much needed bath, better brush the hair to get rid of any debris or tangles caught in the hair. Take some time and prepare the room for a proper bath for your pet. This will include assembling of various items related to the dog bath and also keep some treats handy to reward the pet for good behavior. It is better to remove the lead and collar of the pet. However, if you still need to restrain the animal, better use a specialist bathing tether or a muzzle. It is very important for you to make sure that the water is in lukewarm temperature and you also have an anti-skid mat on the floor to prevent the animal from slipping over. It is good for you to introduce your pet to the water gradually. Try and spray some water on the back of the animal so that it can get used to the feel of the water. It is good to prevent the dog’s face from coming in contact with the shampoo. You may use a cotton balls and place them in their ears and also apply a little bit of petroleum jelly around their eyes. Brush the hair on your dog in the direction of their growth with the help of a soft brush. This will help create lather and also allow the shampoo to get in without creating tangles. You may also use the same brush to clean the paw pads gently. Start rinsing from the face with the help of water. Work your way down the rest of the body until the water runs clear and free of lather. Once the bathing process is complete, make sure to let your dog stay warm until it is completely dry. 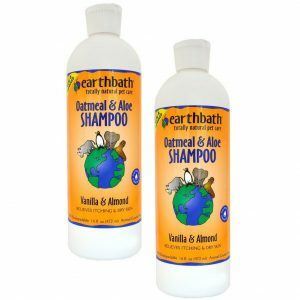 When it comes to dog shampoos, one of the best in the market is the Earthbath All Natural Shampoo. As the name suggests, it is made with everything natural and contains no perfumes, DEA, harsh chemicals, and synthetic dyes. If you use this on your beloved pet, you need not worry about harsh chemicals harming your pet. Even if you have applied tick and topical flea products on the fur of your dog, the thick lather of this product will not wash them off. It can easily heal irritable itching and promotes healthy skin and also treats oily fur like a charm. The sudsy runoff has been guaranteed not to harm any living thing. It makes your dog’s skin healthy and adds moisture to the skin. 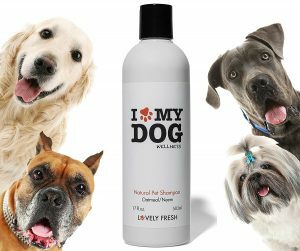 It contains vital ingredients such as vanilla and almond oils to help you pet smell clean and fresh. May not be suitable if your dog has any skin sensitivities. This is an oatmeal dog shampoo, as well as, a conditioner. It is usually recommended by vets for those dogs who have allergic reactions to flea bites, food, and grass. This shampoo can easily be used for cats, dogs, rabbits, and ferrets. The pH balance of this product is such that it can easily be used for sensitive skin. It does not contain any alcohol, artificial colors, sulphates, artificial fragrance, and harsh chemicals. It is made will everything natural. It is a soap and detergent free shampoo which is sure to make the bath time a pleasurable experience. It contains aloe extracts, vitamins A, D, and E, along with almond oil which will not irritate your pet’s nose, skin or eyes. It is not recommended for dogs with sensitive skin. May make the hair dry and coarse for some dogs. This is a high quality premium shampoo meant for dogs. It has been made in such a way that it helps to make the coat of your pet healthy and beautiful. It helps to nourish the hair from the root to the tip. It improves the overall appearance of your pet and also removes any bacteria from the coat of your beloved pet. The long lasting fresh smell remains for several days after giving your dog its much needed bath. It is made with natural ingredients such as neem oil, oatmeal, and vitamins to desensitize, soothe, and moisturize the skin. It is very easy to rinse after foam and also contains a conditioner inside. It does not contain any detergent, alcohol or soap in the formula. It is bio-degradable and the container is a recyclable bottle which is good for the planet. Many dog owners may not like the smell of the product. Some dogs may have a bad reaction and generate sores on their skin. 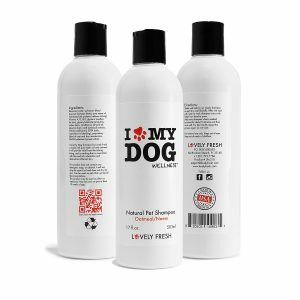 This dog shampoo is made with 100% organic and natural materials and contains no chemicals or preservatives. It contains bentonite clay, which is popular for its healing abilities. It can easily bind with toxins, fungus, heavy metals, and bacteria and pull them away from the skin. This leaves behind a soothed, calm, and clean skin. This product also contains argan and neem oil, which are popular for their anti-fungal, anti-septic, and anti-bacterial properties. Apart from essential oils, this product also contains aloe vera and shea butter which helps to soften, moisturize, and sooth your beloved pet’s skin. The oils leave your dog feeling fresh and clean and also smell good for a long time after taking a bath. It does not contain any harsh chemicals that may create skin irritations for your pet. May not help with itching problems all the time for all breeds. 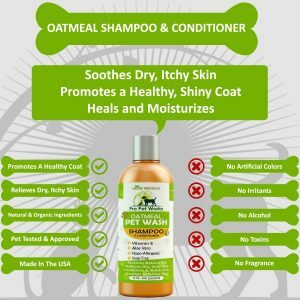 This dog shampoo is made with ingredients which will surely help your pet lead a healthy and clean life free of frequent itching. 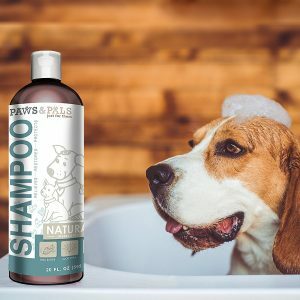 It contains ultra-purified water along with sodium laureth sulfate, barbedensis extract, vitamin E, and many more natural ingredients which are good for your dog’s skin. It has a delicate balance of essential oils which helps to take care of your pet’s coat. The natural ingredients in this dog shampoo does no harm to your pet’s nose or eyes. It ensures that your pet enjoys its bath time without any pain or irritation. 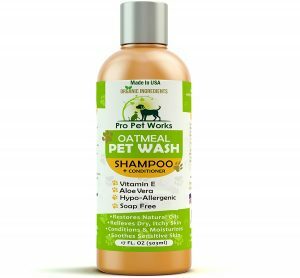 This organic shampoo respects nature and also your dog by providing best possible coat treatment and skin care. Many pet owners may not like the smell of the shampoo. The container of this shampoo may not last for a long time, especially the cap of the bottle. May have reactions which may vary from one dog to another. 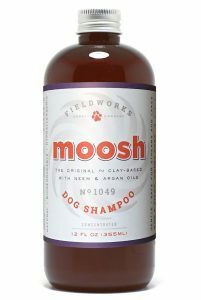 Amongst those mentioned above, the Best Shampoo For Dogs would be Earthbath All Natural Shampoo (CHECK BEST PRICE HERE). It does not contain any harsh chemicals nor any synthetic dyes or DEA and it is absolutely good for your pet.it helps to make the skin of your dog healthy and free from any irritations.